Development is powered by your donations! Simple tool to configure Windows Filtering Platform (WFP) which can configure network activity on your computer. The lightweight application is less than a megabyte, and it is compatible with Windows Vista and higher operating systems. You can download either the installer or portable version. For correct working, need administrator rights. You can download either the installer or portable version. For correct working, need administrator rights. 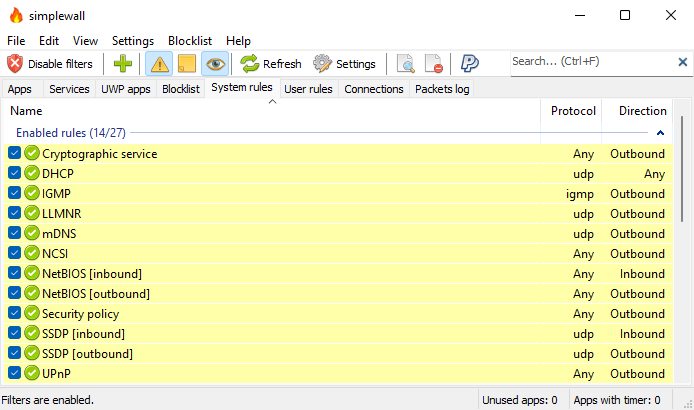 To activate portable mode, create simplewall.ini in application folder, or move it from %APPDATA%\Henry++\simplewall. Binaries have GPG signature simplewall.sig in application folder. Put simplewall.lng file into application directory and restart the program. (c) 2009-2019 Henry++. All rights reversed.